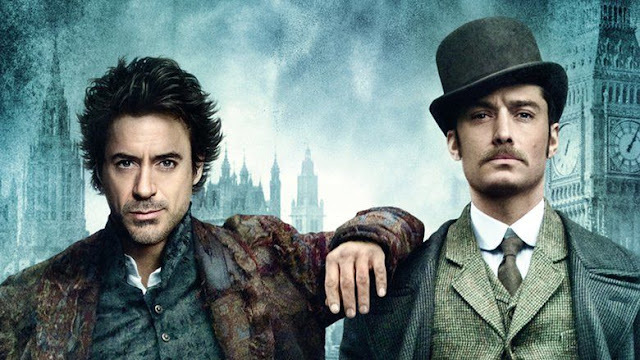 Sound & Vision: SHERLOCK HOLMES | Warped Factor - Words in the Key of Geek. Chris Morley winds his way down to Baker Street. We're winding our way down to Baker Street for a look through the musical casebook of Sherlock Holmes - one of the most durable fictional characters ever to appear on screen as the subject of several such adaptations whether big or small! Indeed the Guinness World Records list Sir Arthur Conan Doyle's creation as the most portrayed in history across 200+ films with 70+ actors having taken the part of the Great Detective. Guy Ritchie's curious at best attempt to modernise things & have the not at all British Robert Downey Junior take on crime with Jude Law at his side as Watson is where we begin. The first movie was released in 2009, a sequel following within two years as this latest detective played a Game Of Shadows. The films themselves were released to a somewhat lukewarm reception, but at least they got something right in consideration of the man brought in to do the music, no less than Hans Zimmer. "...2 weeks of piano lessons. I was thrown out of 8 schools. But I joined a band. I am self-taught. But I've always heard music in my head. And I'm a child of the 20th century; computers came in very handy." Perhaps the marriage of the two was in his blood? "My mother was very musical, basically a musician and my father was an engineer and an inventor. So, I grew up modifying the piano, shall we say, which made my mother gasp in horror, and my father would think it was fantastic when I would attach chainsaws and stuff like that to the piano because he thought it was an evolution in technology." Not so far outside the box nowadays given the advances in music technology, you'd think. Zimmer would be somewhere near the forefront in seeking to blend his electronics with the more traditional orchestral sound, finding a like mind in fellow composer Stanley Myers with whom he would go into partnership in the early Eighties. Take a listen to the scores for Moonlighting & My Beautiful Launderette to hear the fruit of their labour. "The Raymond character doesn't actually know where he is. The world is so different to him. He might as well be on Mars. So, why don't we just invent our own world music for a world that doesn't really exist?" Synths & samplers were deployed on the second, what appears to be piano actually being played on a Roland MKS-20. As the man charged with that sonic deception admitted to Sound On Sound. "It didn't sound anything like a piano, but it behaved like a piano." Equally ambitious were his travels to Africa for 1992's The Power Of One, recording the drum & choral sounds of the music of the cradle of humanity for an adaptation of Bryce Courtenay's original novel. Traveling the world for musical inspiration would seem to be Zimmer's modus operandi, as many years later Zimmer and Sherlock Holmes director Guy Ritchie would travel to Slovakia, Italy, and France to research the authentic Roma music for their collaboration. Ritchie had long been a fan of Zimmer's work before the pair finally collaborated for the big screen. But it was Zimmer's work on The Dark Knight which had particularly caught Ritchie ear, so much so the director used that soundtrack as temporary music during editing of his Sherlock Holmes. It wasn't long before he called in the great composer. Zimmer was pleased when Ritchie asked him to do the score, and after their travels he presented what he described to Ritchie as the sound of The Pogues joining a Romanian orchestra! For the musical accompaniment, composer Zimmer used a banjo, cimbalom, squeaky violins, a "broken pub piano" and other unconventional instruments such as the Experibass. "We rented 20th Century Fox’s underground car park one Sunday and did hideous things to a piano." Sherlock Holmes and the Case of the Hideous Thing Done to a Piano. A possible title for a third Ritchie movie perhaps?